This Hydraulic Table Cart has a hydraulic scissor lift tabletop with easy foot pedal operation. 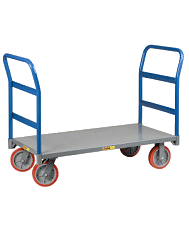 It's ideal for lifting, positioning and transporting heavy materials around the shop, factory, warehouse or office. 500lb. capacity. 9 1/4in. to 28 5/8in. lift range. Rugged all-steel table with durable powder-coat finish is easy to clean and easy to operate. Rolls on 2 swivel casters with brake and 2 fixed casters. Roomy 27 3/4in.L x 17 3/4in.W platform. 35in.L x 17 3/4in.W x 35 1/2in.H overall size.